Perfect for my needssubmitted by Thomas C. - Mar 26, 2019 |Recommended: YesSafe, clean, friendly, nice amenities. Responsive and polite staff. response from property - Apr 12, 2019 HI Mr. Copeman, We're so glad you decided to renew...and we appreciate the 5 stars :-) As far as noise, are there any specifics we can help with? Are you hearing noise in the clubhouse after 10? Please let us know so we can correct anything that we can. You can email me at cindy.thibeault@bonaventure.com Thanks so much! response from property - Feb 27, 2019 Thanks so much for your kinds words; we're so glad you enjoyed living at AURA! We truly care for our residents and wish you all the best! Great Place to Livesubmitted by Jordan H. - Dec 28, 2018 |Recommended: YesThis is my first apartment and I love it here. It's quiet, cozy and comfortable. The staff members are so helpful and friendly. LOVE ITsubmitted by Danielle C. - Dec 12, 2018 |Recommended: YesIt's in the best location. Very convenient to everything. It is great. The atmosphere the quality of life is very goodsubmitted by Michael M. - Dec 03, 2018 |Recommended: YesThe staff are professionalism, knowledge, helpfulness, and overall service level. Apt 221 Reviewsubmitted by Abigail D. - Oct 31, 2018 |Recommended: YesI hear my neighbours often. Their child screams and runs around at night, which is distressing. Also, I hear a small dog somewhere in the hall barking from time to time. Some more sound proofing in the walls would work wonders. I like the community activities, but there are too few. It would be wonderful if we could have atleast one community event every month. The event could be as simple as a trivia night. I deeply enjoyed the Halloween party yesterday. That was well organized and offered a fair range of activities. The hot water heater has not worked efficiently since we moved in. I called the maintenance crew and they came by to fix the issue. The maintenance staff did what they could but the water is still too cold for a bath. If this is a hardware issue with the water heater, I think the building would do well to get new water heaters.. Friendly and Convenientsubmitted by Rebecca M. - Oct 15, 2018 |Recommended: YesI really like it here. People are friendly and so convenient to everything. Couldn't be happier I moved from my old apartmentsubmitted by Norbert D. - Oct 06, 2018 |Recommended: YesGreat location with an awesome staff that is very accommodating to my needs. VERY NICEsubmitted by William J. - Oct 01, 2018 |Recommended: YesVery clean and quiet. Nice accommodations with a great staff. Highly recommended. 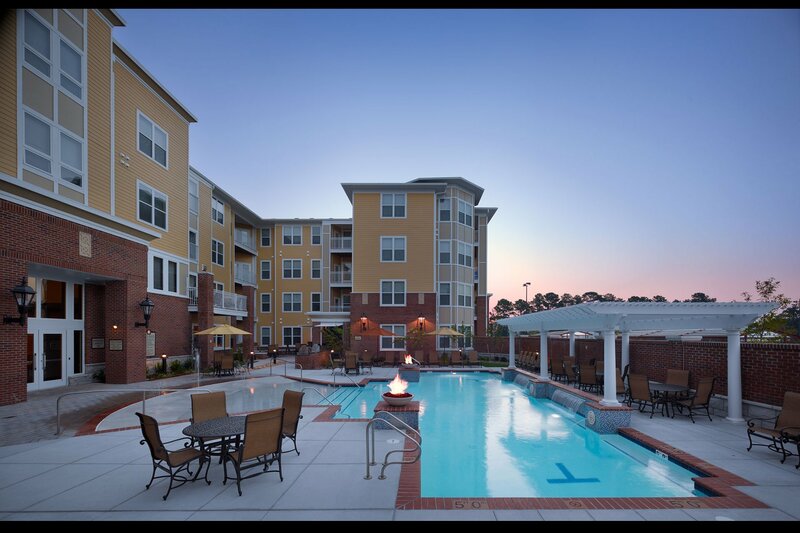 First Reviewsubmitted by Brandon E. - Aug 03, 2018 |Recommended: YesIt's a great place to live the amenities are great. The location is amazing in relation to where you might need to go. In just a 10 minute drive you can be at almost anywhere you would need to be. Happy since the day I've moved in.submitted by Dena H. - Aug 03, 2018 |Recommended: YesI tell people all the time how happy I am and how it's great living here.